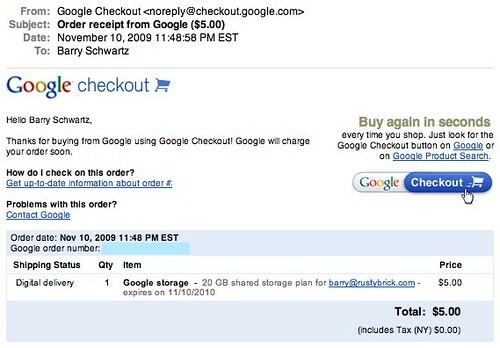 Like many, when Google announced you can now buy more storage for less, I decide to buy more storage. So I went through the purchase storage process, paid the bill, got the order receipt and waited. But when I log in to check my storage available, it still shows the old amount. So I follow all the Gmail Storage Troubleshooting tips and get no where. I then click on the "If you are still unable to access your Google paid storage, please contact us" link. The link is to google.com/support/contact/bin/request.py?contact_type=contact_storage but when you click it, it redirects you to the generic Google help with no way to get real help. I am not the only person with this issue, there are a couple complaining at the Gmail Help forum. It is only $5, so I don't mind donating the money but I do really want the extra storage. Forum discussion at Gmail Help.